Frieda and Ivan. LOOK AT THEM. 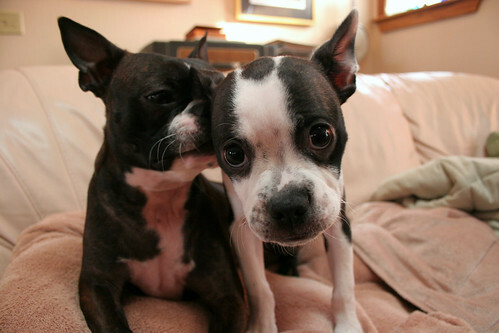 Frieda, a Boston Terrier, is 4. She and her brother Herbie were born in a puppy mill one February, then they spent a hopeless spring in Missouri chained outdoors, turning into knobby starvation victims. They were both rescued by Baxter’s Buddies and we adopted Frieda shortly after she reached a healthy weight (Herbie was adopted by a BB family member). To this day, she is obsessed with food and warm blankets. She’s also a shameless belly rub hustler, and with her silky coat, we’re quick to comply with her demands. Ivan is two-and-a-half. Alicia’s sister’s coworker brought him home and before long, the landlord found out and threatened eviction. When we heard a Boston Terrier puppy needed a home, we were pretty happy to drive an hour away to pick him up, sight unseen. He’s a little maniac. Not as bright as Frieda, but just as endearing. We’re incredibly fortunate that Ivan and Frieda have an official Fairy Dogmother. Alicia’s friend and former coworker, Rebecca, has loved them both from day one, as if they were her own. She and her husband Ed have a fenced backyard and a doggie door and her mother drops in to take them on walks during the day. We’ll miss them dearly, but they’re getting just as much love and care from Rebecca, her husband Ed, and her mother Mary. Couldn’t think of a better foster home for them!